Immediate – It removes the guesswork of choosing what to write each week. It also provides an opportunity to go deeper into topics to share more information while building market anticipation for future blog posts. Long term – It makes it easier to keep your blogging on schedule. You create content equity for future harvesting and recycling as cheat sheets, e-books, e-courses, list-building incentives, newsletters, podcasts, speeches, presentations, and training programs. List the possibilities. Identify as many potential topics as possible. Select the best option. After you’ve identified at least a dozen potential topics, narrow the list to the top three choices. Analyze those, and choose the topic “most likely to succeed” for your first series. Commit and schedule. Avoid the temptation to second-guess your choice. Instead,commit to action by scheduling the publication dates, start dates, and deadlines associated with each blog post. For your convenience, here are three downloadable and printable worksheets to guide you as you act on each step. Start by identifying as many potential series topics as possible. At this point, focus on the overall idea for the series, not the title for the series. Simply try to identify and capture as many ideas as possible that coincide with your market’s information needs and your firm’s expertise and goals. 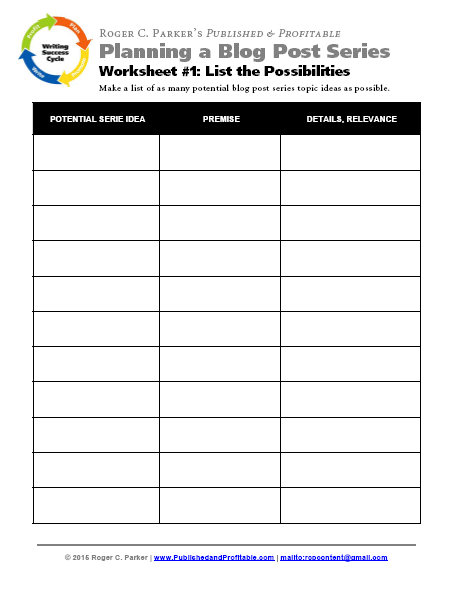 Start by downloading and printing several copies of Worksheet 1: List the Possibilities. The worksheet is intended to be completed by hand. You might find yourself adding topics while away from your computer, or noting ideas before going to sleep or after you wake up in the morning. Consider printing and sharing copies of the possibilities worksheet with co-workers and staff before brainstorming sessions and meetings. Focus on quantity, not quality – Avoid premature judgments. Avoid the temptation to judge topics as you write them. Simply include a few words or phrases to describe the premise (or rationale) for each idea along with a few key details that suggest ideas to possibly build upon later. Adapt the worksheet to your needs – If a PDF format isn’t appropriate for your workflow, recreate it using a spreadsheet, mind-mapping program, or whatever format is appropriate and comfortable. Consider Google Docs so your coworkers or clients can easily access the worksheet and contribute their ideas. For “buildable” core topic ideas, refer to resources like 12 Months of Content Marketing Ideas for SlideShare or the SlideShare based on it. Narrow your choices to three topics, then prioritize in order of importance. In this step, you’re not only identifying the best choice for your first blog post series, you’re also identifying topics for follow-up blog posts. The best way to do this is to use Worksheet 2: Choosing the Best Options. 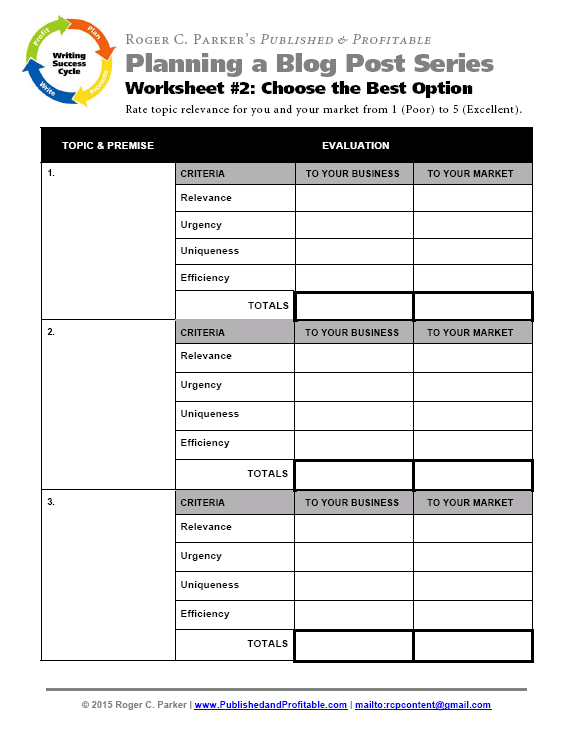 This worksheet helps you analyze your top three options from the point of view of your business as well as the topic’s “fit” with your market’s information needs. Relevance – How relevant is each topic to your ideal clients as described in yourbuyer personas? Will the topic help your market address one of its most important goals or persistent problems? In addition, how relevant is each topic to your company? Specifically, how does each topic relate to your firm’s key competences or profitable products or services? Urgency – The priority of topics should reflect the importance of the topic to your market and your business. Topics of major concern to your market (in terms of costs and delays, lost opportunities, or stress) should be addressed before topics of lesser importance. Urgency should also reflect trends in your field, as reflected in current breakthroughs, influencer activities, or social media conversations. Uniqueness –A topic’s uniqueness should reflect the percentage of your market that is likely to be interested in each topic. The topic should also reflect your firm’s expertise and strengths compared to your competitors. The goal is to select desired topics where your firm possesses a significant competitive advantage. Efficiency – How easily can your market and your firm benefit from each topic? How easily will it be for my market to implement each topic? Look for low-hanging fruit topics that will be relatively easy to implement and profitable. Likewise, from your firm’s point of view, how easy will it be to develop each topic? Look for topics that leverage existing content equity, knowledge, or processes. Avoid topics that require reinventing the wheel in terms of acquiring new knowledge, skills, or extensive investment in staff and vendor time. Don’t worry about scientific accuracy in the evaluation. Follow your initial hunches and move on to the topic or criteria. Focus on building and maintaining project momentum. Later, if desired, you can fine-tune and test your topic choices. This is the make-or-break step in creating a successful blog post series. Schedules reflect your commitment to your idea. They convert ideas and intentions into content marketing success. Nothing can happen until you’ve indicated your commitment to action by scheduling each blog post, and entering it into your editorial calendar and workflow. Once you’ve taken this step, you’re well on your way to success. 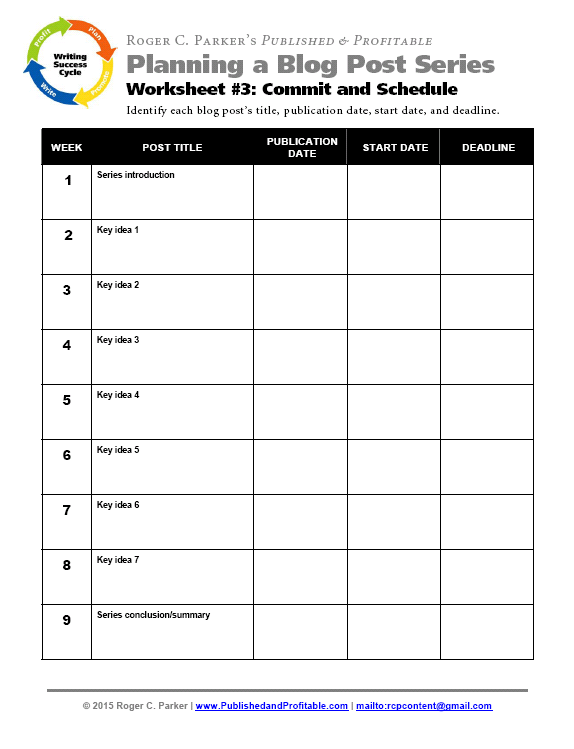 Accordingly, as soon as possible, after you’ve finished prioritizing your top three blog post series topics, download and print Worksheet 3: Commit and Schedule. This helps overcome the all-too-common inclination to put off starting a new endeavor until there’s time. Number of posts in the series – The series length is determined by the number of key ideas you want to introduce in the first post, develop in the middle posts, and summarize in the final summary or call-to-action post. In general, I recommend following the introductory post with a minimum of three and a maximum of seven posts. Avoid wearing out your welcome by making the series too long. Resources – Be guided by your staff and vendor resources, including budget, when determining the length of your blog post series. Blog post titles – Now is the time to begin selecting a series title for your blog posts, as well as the topics and titles for the individual posts. As always, be guided by SEO considerations. Choose a series title and individual post titles around the relevant keywords your market uses when searching for information. Exercise restraint – Be realistic when selecting publication dates, starting dates, and deadlines for completing each topic. Remember, there’s more to completing each topic than selecting the right words. We live in a visual age, and we have to schedule time to locate and create graphics. These graphics usually have to be modified and resized for the various social media marketing channels when you promote each post. You also have to schedule time for editing and proofing each blog post before it goes live. The top is wide – The focus is on quantity. Use Step 1’s List the Possibilities worksheet to identify as many series ideas as possible. The middle is narrow – Replace quantity with quality by using Step 2’s Choose the Best Options worksheet. Focus your attention and prioritize the three most important topics in terms of how well they align with your market and your business. The bottom is wide – In Step 3, when you commit to action by selecting titles, and scheduling publication dates, starting dates, and deadlines for the individual posts in the series, you’re opening the door to more opportunities. You’re taking the first steps to creating content equity, incentives, and products and services for attracting and building relationships with more of your ideal clients. Share your impressions of my three-step, worksheet-driven approach to creating a successful content marketing blog post series. Has the series approach worked for you in the past? If you haven’t tried it, do you think the approach described above can work for you? Share your questions and concerns as comments. Want to learn more about how to develop content that your readers want? Check out all the sources in the Content Marketing Institute content creation hub. 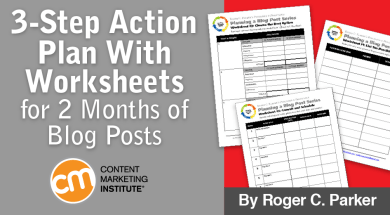 via 3-Step Action Plan With Worksheets for 2 Months of Blog Posts.